One of the reasons it took me so many years to craft my debut picture book, THE WILLIAM HOY STORY, HOW A DEAF BASEBALL PLAYER CHANGED THE GAME (Albert Whitman, March 2016) is that I didn’t know how much I didn’t know about the art of picture book writing. And here’s a little secret. I have three more books coming out and I am still learning. We are all always learning. And that’s why I love ReForReMo, because it’s a way for us to learn from each other. All my books so far have been non-fiction biographies. Two are about athletes, one is about a man who moved a mountain and one is about a princess. My fifth book is about a musician, but it’s still a few revisions away from where it needs to be. I’m currently working with an editor on it. One of her notes was to give a sense of the music that my subject hears as he moves through and makes sense of the world. I also want to convey why the music was so important to him and to those who heard it. 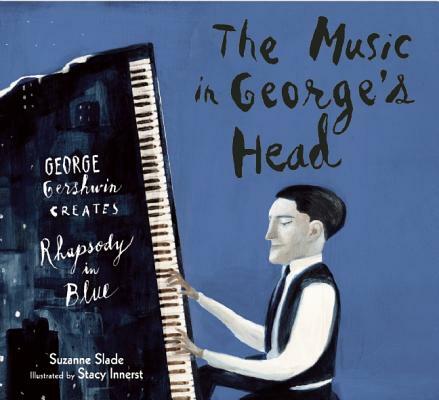 THE MUSIC IN GEORGE’S HEAD by Suzanne Slade, illustrated by Stacy Innerst (Calkins Creek). I love the way this book starts: “George heard music all the time. At home. At school. Even when he was roller-skating down New York’s busy streets.” I also like the way she describes the noises that George hears, such as the “Rattle-ty-Bang! of the train and it got me thinking about fresh ways to convey the kind of sounds my subject might have heard. DIZZY by Jonah Winter, illustrated by Sean Qualls (Arthur A. Levine Books). What I felt here was the emotional connection between a child’s difficult childhood and the way music provided an outlet. This book helped me understand the urgency and passion of Dizzy’s music. 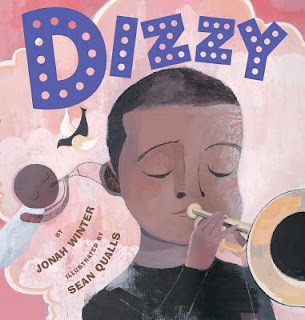 Jonah Winter sets it up in the beginning: “This is the story of one real cool cat who must have been born with a horn in his hands…But, to tell you the truth, he wasn’t born with a horn in his hands. He was born very poor and very tough.” My subject had a rough start in life, too. RADIANT CHILD by Javaka Steptoe (Little, Brown and Company). This book about artist Jean-Michel Basquiat combined the lesson I learned about the power of musical language from THE MUSIC IN GEORGE’S HEAD and the emotional urgency that throbs through DIZZY. 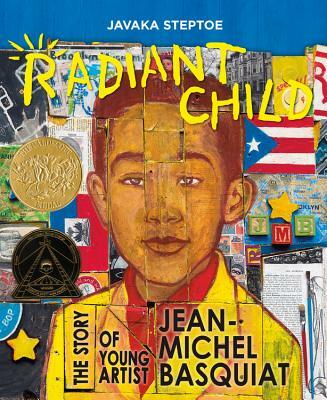 This opening has both: “Somewhere in Brooklyn, between hearts that thump, double Dutch, and hopscotch and salty mouths that slurp sweet ice, a little boy dreams of being a famous ARTIST.” The book intertwines Jean-Michel’s creations with the challenge of growing up with a mother he loved who suffered from mental illness. This made me think about how my subject lost a parent at a young age. 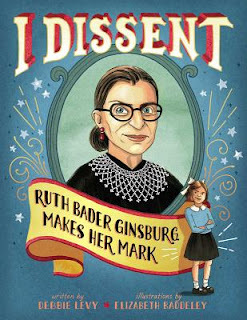 I DISSENT, RUTH BADER GINSBURG MAKES HER MARK by Debbie Levy, illustrated by Elizabeth Baddeley (Simon & Schuster). This book shows how Ruth Bader Ginsburg dealt with prejudice. Ginsburg used the law to battle injustice. My subject faces prejudice, too, but uses music to create a more inclusive world. This book also showed me the power of having two words that repeat and build through the book. In this case, the words are “I dissent,” which do double duty as words of the law and words of a person who is determined to make the world a better place. That led me to wonder what my subject’s signature words might be. 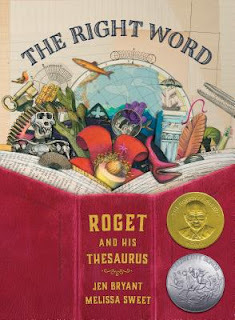 THE RIGHT WORD, ROGET AND HIS THESAURUS by Jen Bryant, illustrated by Melissa Sweet (Eerdmans Books). The writing here is so deceptively simple, you almost forget that you’re reading as a little boy emerges who interprets the world through the lists he creates, the lists that one day, when he’s older, will become Roget’s Thesaurus. I realized I need to do for my subject what Jen Bryant did for Roget. I need to show how he understands the world through music the way Roget does through lists. I need to blend in what I’ve learned from my other mentor texts as well: made-up words that suggest sounds, the urgency of an artist who must create, the persistence that pushes someone to persevere through heartache and the conviction and conscience to stand up for inclusion. You don’t want to copy what someone else has done. But the beauty of ReFoReMo is that an idea you pick up from here or there may lead you to the magic ingredient that will bring your manuscript to life. Thank you, Carrie Charley Brown for this wonderful assignment. I am excited about using what I’ve learned from my mentor texts as I dig back into my revision! Nancy is happily donating one signed copy of The William Hoy Story along with a Teachers Guide at the conclusion of ReFoReMo. She hopes it may prove helpful as a mentor text! To be eligible, please comment on this post and make efforts to read mentor text regularly. 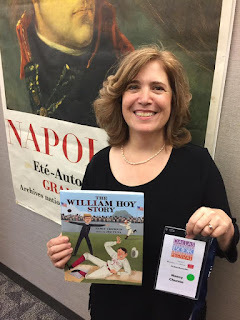 Nancy Churnin is the theater critic for The Dallas Morning News and the author of The William Hoy Story, How a Deaf Baseball Player Changed the Game (Albert Whitman & Company, March 2016), selected for the 2017 Texas Library Association 2X2 List and the New York Public Library’s Best Children’s Books of 2016 list. Her upcoming books are Manjhi Moves a Mountain (Creston Books, September 2017); Charlie Takes His Shot: How Charlie Sifford Broke the Color Barrier in Golf (Albert Whitman, January 2018) and The Princess and the Tree (Albert Whitman, November 2018). Nancy is raising four boys and two cats with her husband, Dallas Morning News arts writer Michael Granberry. I loved getting these mentor texts, perfect timing for a project. It's so fun to see these authors we've come to know publishing books we've watched grow. Great advice, Nancy. I bet you'd do a good bio on Chubby Checkers, the singer. Bios have always interested me, particularly ones about musicians. I love how you use mentor texts for a specific manuscript you are working on, choosing similar themes, styles, and underlying tones. I love it because I'm doing the same thing right now! Great NF bio recommendations! I agree that the "beauty of ReFoReMo is that an idea you pick up from here or there may lead you to the magic ingredient that will bring your manuscript to life." So true from my experience! What great books you've listed, Nancy. I can't wait to get a copy of Manjhi Moves a Mountain!!! It's wonderful that you've found your niche and area of expertise. The PB biographies you mention as helpful mentor texts are indeed inspiring, as are your books (published and soon-to-be published). It's like you're sharing with us your own biography about your journey writing PB biographies. You are such an inspiration! Thank you, Nancy, in being so specific in how these mentor texts will improve your current WIP. Very helpful! Lots of great examples here. Thank you so much for the post, Nancy! So glad for all the mentor texts suggestions. Best of luck with your current and future books. Loved the examples you gave us. Thanks again for the post. What marvelous take-aways for you and for all of us! This was a terrific post with insightful take aways. Thanks so much! I loved your post, Nancy! Thank you for your advice on how to apply the insights you receive from reading mentor texts. And thank you for all the recommendations! The Right Word is one of my very favorite books, but I will look for all the others also. Best of luck with all your books coming out, can't wait to have my own copies! I totally agree with: "the beauty of ReFoReMo is that an idea you pick up from here or there may lead you to the magic ingredient that will bring your manuscript to life." Well said! Thanks for the mentor text suggestions! Great post! Thank you for your specific insights about each of the mentor texts. Thank you for the post. I loved how you took us through your process of how you used the mentor texts. Congratulations on your books! Thank you for a look at researching as you write. This is one of my favorite posts yet, mainly because these are my kind of books. I always feel smarter, encouraged and have a I-can-do-attitude after reading one of these books (Imagine what a kid must feel like!) and especially after reading Nancy's blog today. Thank you for sharing. Thank you for the specifics on how mentor texts can improve current work. Hi, Nancy! I love biographies. I've had an idea for a PB biography for a while now, but I know it requires a lot of research and I'm sort of afraid to tackle it. It's just so much going on in my life already. Anyway, while reading your post I thought of two other subjects that would be awesome to write about and I might just put my fear aside and get started. Thanks! Thanks, Nancy, for an insightful look at the way you utilize mentor texts for your projects. These are great examples! Great post and mentor text examples. We are all searching for that magic ingredient that will make our stories soar! "The beauty of ReFoReMo is that an idea you pick up from here or there may lead you to the magic ingredient that will bring your manuscript to life." I love what you've said here Nancy because it's so true. Reading other PBs is inspiring, and it sparks our own ideas. I can't wait to read the titles you've suggested here. Congratulations on your upcoming publications! I am always amazed at how you can locate facts on someone who is literally not well known. You have to be a detective of facts. Thanks for your post! Great biography suggestions, and the point that an idea picked up can lead to a creative new magical ingredient. Thanks Nancy! These are indeed musical books. Love them! Thank you for this fantastic post! The kids and I enjoyed the William Hoy story and we're looking forward to reading your other books. Thanks so much for this post! It is most insightful! Love these books. Non fiction is so fun! :) Thank you for sharing. I've placed the books on hold at the library and Radiant Child is back-logged 15 people. Must be a good one! Thanks, Nancy. Thanks Nancy for great examples of mentor texts. Thanks for sharing nuggets from each one. Nancy, I love all the mentor texts you listed and how they helped get you to the next level in your writing. Your post is going to help me with a nonfiction picture book manuscript I'm writing where I need to connect my subject more lyrically to his work. Love this: "the beauty of ReFoReMo is that an idea you pick up from here or there may lead you to the magic ingredient that will bring your manuscript to life." I've been searching for that magic ingredient and I think you and ReFoReMo have given me an excellent road map. Thank you! Great selection of mentor texts, Nancy. Gotta say my fav's are I Dissent and The Right Word. Just had to go back to them a few times for story, structure, illustration. Great post, Nancy! I love Non-Fiction Picture Book biographies. At the moment I am currently working on 6 of them, including 2 series. I agree that the "beauty of ReFoReMo is that an idea you pick up from here or there may lead you to the magic ingredient that will bring your manuscript to life." Nancy, super post for sure. I have read most of these books, but am going to reread them. We are all still on the learning curve to great writing. I is comforting got know that even break-through writers like you, need craft, too. Hugs. Thanks so much for the insight you provided into your process, Nancy, and sharing what speaks to you in each of the mentor texts you listed! Really helpful. I can't wait to read your new books! Not sure I'll ever write a picture book biography, but everything you said can be applied to made up characters as well. Thanks for a very clear post showing exactly what is meant by "mentor texts". Thank you, Nancy! I agree, "We are all always learning." Thank you, Nancy. I think your observation of identifying the kernel of what motivates your subject, either real or fictional, from an early age and weaving that through the story is spot on. I can't wait to read the mentor text suggestions with that in mind. Thank you! I always love a list of nonfiction PBs. Can't wait to read these. You've got some great models to work with here! Thanks for sharing. Nancy, this is so helpful. I have a rough draft of someone who wanted to preserve his musical heritage. Only a first draft, but your suggestions will help me as I revise. So glad I got to meet you in person last summer. What a treat! Write on! Thanks for recommending such great mentor texts and sharing your thoughts, Nancy. How I admire PB authors that write non-fiction in such a clever way. Re: I Dissent: I am a sucker for signature repeat words that a strong MC makes his/her mantra. I strive to do the same in my texts, and I really appreciate when I see mentor texts doing the same. It helps hone this home for my in my writing. And in re: the music, I just LOVE when a picture book about music reads like a song. Thanks for sharing! I can definitely relate "I didn't know how much I didn't know"
I loved this progression through the mentor texts and how each lent an element (or two) to the way Nancy approached her latest manuscript. Looking forward to reading Dizzy and The Music in George's Head, which I haven't been able to do yet, and Nancy's forthcoming book as well. Thank you, Nancy! Thank you for this inspiring list and thoughtful encouragement. I loved seeing your thought process as you went through the mentor book list. I'm working on a biography and you have given me much to think, and read,about. Lovely list! Thank you, Nancy! thanks, Nancy for sharing your effective use of mentor texts. This is a keeper. I love your mentor text suggestions. The words are so carefully chosen and beautifully written. I learned so MUCH about biographies. Thank you Nancy! Jen Bryant's work is so lyrical and gorgeous, and I've been using it as mentor texts as well. Can't wait to read your work, Nancy! I'm just discovering PB biographies and nonfiction. Thank you for the great mentor texts! Congratulations on your upcoming three books, Nancy! It was helpful to read your thought process as you think about your revision. Wow, Nancy! This is so insightful; you've given us a wonderful list of biography mentor texts and honed in on clear and specific qualities each exemplifies. Thank you! Thanks for showing how you used mentor texts in your own writing. These are all wonderful books. Thank you for showing us how you used them to improve your writing. Very insightful! What an awesome post! This was so informative. Thank you, Nancy! These are wonderful examples of mentor texts. Thanks for sharing your insights into how they motivated you in writing your books. Thanks Nancy. I'm currently working on my third nonfiction historical pb and it's often a task to find mentor texts. Your list is a big help! Thanks for these wonderful texts and sharing how they inspired you. Nancy, you brought the heart and emotion to The William Hoy story and I have read my copy many times. Thank you for sharing tips and examples for finding the heart and emotion in our stories. I'm looking forward to your new books! THE WILLIAM HOY STORY is a joy Nancy! Thank you for sharing the book and your post! Thank you Nancy. I love how you've shown the specific lessons you're taking from each book to apply to your WIP. Excellent! Nancy, thank you for this post. Finding the music is what it's all about! Thank you for sharing, Nancy. I love all of these books! Nancy, you've given wonderful examples of NFPB mentor texts. I love the idea of just taking a nugget from each book and letting those sparks ideas that will enhance our own manuscripts. Thank you so much Nancy. My girls (age 8 and 6) loved I Dissent. The older one was fascinated that she's still alive and on the court. I am for the very first time tempted to write a NF PB biography. The problem is, every time I think of a good subject, I see someone else has beaten me to it. Thank you for helping us find those "magic ingredients." Fantastic list, Nancy. Congrats on your upcoming PBs! Nancy - thanks for this wonderful post...your insights about how you are using the mentor texts for our own work provided such concrete examples as I use mentor texts to help with my PB manuscripts. I look forward to reading your upcoming books! Thank you, Nancy, for your insightful comments. Absolutely love this day! Nancy's take on each of the books led me to the conclusion that perhaps I should be studying other's works, just because I might pick up a great idea for my characters. I am writing a lot of biography, also, so I could relate to her lesson. I have been almost peeking at this event, because I want my work to be my own...Nancy made me feel much better about the influences of reading other authors. Nancy, teachers teach by modeling. Thank you for modeling your process for using mentor texts to help you revise your current work in progress. For those of us planning on writing biographical Picture Books, you've given us the perfect mentor texts to analyze. Thanks so much for sharing this progression of ideas using your research texts and your needs with current manuscript. It is so true that you never know where your going to get the inspiration to work on your own manuscript! Looking forward to reading these texts--and I've already read Your book about William Hoy! I have always enjoyed biographies. Thank you for these suggestions. To have these five books speak to you about your one book is a great example of the gems we find in books if we look deep enough. I will look even deeper because of your post. Thank you! Thank you for sharing your process. I think I learn best by seeing how other authors use mentor texts to inform their own work. Very helpful! Loved your book, Nancy. That moment when everyone in the stadium signs was so moving! And many of these are my very favorites, especially The Right Word. It's just perfect in every way! Thank you for showing us how you used mentor texts to help spark your manuscripts/books! Thanks. It was helpful to see how each mentor text might give you insight with your story. Just picked up I Dissent from the library today. Love it! These are great NF PBs to study! Thanks for sharing examples of how you look out for ideas that lead to the magic ingredient for bringing a PB draft to life! "The Noisy Paint Box: The Colors and Sounds of Kandinsky's Abstract Art. The NOISY PAINT BOX is a beautifully illustrated story about a boy who decides to be true to himself and let the colors sing!" I highly recommend this book to you, as well as anyone who wants to infuse their writing with more feeling to convey such things as music and colors. BEAUTIFUL!!! HAPPY WRITING!!! Thanks for this great list of books and for sharing your process of using mentor texts when writing your own PBs! Great post! I liked the idea of using "signature words." I've seen them before , but never really considered them a story element until today. Thanks also for the great list of mentor texts. Great examples. Thank you so much for the post. Thanks for this wonderful post and great list of NF mentor texts, Nancy. Nancy, thank you for showing how you take pieces from each of your mentor texts to create something new. I love that! I also love "The William Hoy Story" and look forward to reading your all of your books--especially the new one. I'll be looking for signs of your mentor texts. "One of the reasons it took me so many years to craft my debut picture book is that I didn’t know how much I didn’t know about the art of picture book writing." - Thank you for opening with this line. It gives me a lot of encouragement to keep on keeping on. :) Congratulations on your debut book and the ones following. This is my favorite post yet! What a magical way to connect the dots to completing your own story. Thanks for sharing your process alongside the fabulous resources you've used en route. Thank you for sharing your writing journey, Nancy, along with some outstanding titles. You words of wisdom ". . . an idea you pick up from here or there may lead you to the magic ingredient that will bring your manuscript to life," resonate with me. This was so interesting and helpful! I look forward to reading all of the books mentioned in this post. Thanks very much! This was a fabulous take on using mentor texts! Thanks for taking the time to share with all of us! I had a great time in the biography picture book section of the library this week, and had a hard time pulling myself away, when the kids had conveyed they were ready to go home! Thanks for your recommendations on mentor texts! One piece of your reflections stood out significantly for me: "an idea you pick up from here or there may lead you to the magic ingredient that will bring your manuscript to life." I LOVE this idea! It's the reason I carry my phone or a piece of paper or notebook or ANYTHING with me at all times. I like being able to jot down whatever thought pops into my head, whether it's an idea for a new book, or a way to improve an existing draft. Nancy, thank you for these recommendations and for also including the specific ways you were able to apply techniques employed by those writers to your own subject. Thank you for the detailed information and strategies to build depth in our stories. Congratulations on your publications! Thanks for sharing these books and your process. And congratulations on all your publications! I had never really read picture book biographies. I enjoyed these immensely. They are so creative in their words, illustrations and book design. I'm so glad you recommended them. And you also helped me understand another way to use mentor texts. Thanks for your insight into using mentor texts. I'm still waiting for three of these titles from the library, but really enjoyed Dizzy. I have to look for more by Jonah Winter. Congratulations on all of your upcoming books--I look forward to reading them. 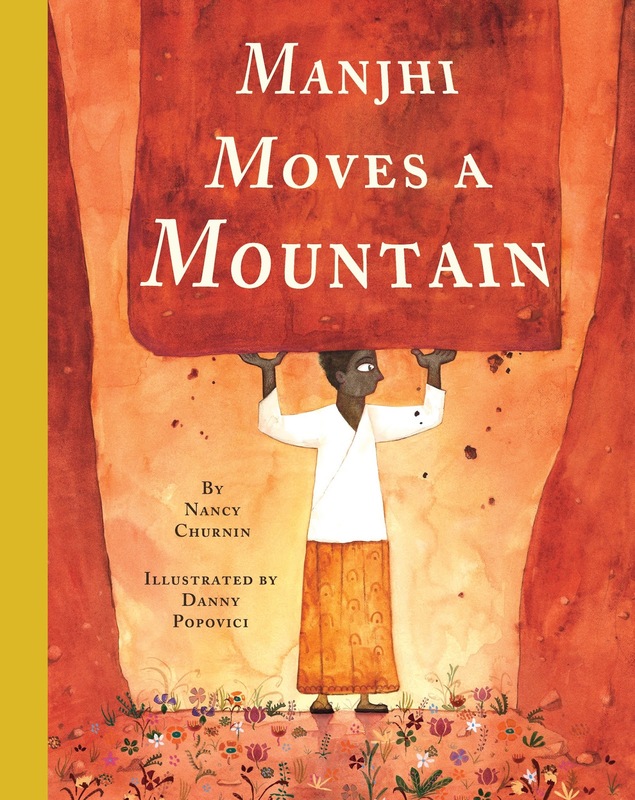 Manjhi Moves a Mountain look as especially intriguing! A great group of books. I love the idea of finding a group of books similar to a story I'm working on to sift through them and find what makes them sing to me! Great example of how mentor texts can help our writing! Thank you for sharing! I write PB biographies and especially appreciated this post. The biographies were wonderfully entertaining, inspirational, and educational. Thank you! Nancy, I love these mentor text recommendations, since I'm working on a pb bio right now. Wonderful post; thanks very much! Thanks for sharing these mentor texts with us. I appreciated your sharing how you used them to inform your own writing. It will be interesting to try this with my own manuscripts. Valuable insights! Great reading selections and observations to ponder. Many thanks. These are wonderful mentor texts, thank you! And thank you for your helpful insights. What great mentor texts! I love THE RIGHT WORD. Thank you! Yes, these texts have so much to teach us. As a young girl I played rhapsody in Blue. I am ordering The music in George's Head for my permanent collection. Thanks for these delightful reads. As a lifelong devotee of Roget's Thesaurus, I can't wait to read The Right Word. Thank you for all your recommendations! Nancy, thank-you for flaming the cinders of a fire long left abandoned. I have two biographical PBs that I have worked on. The completed manuscripts, just weren't working, so I set them aside. I'm looking forward to studying your suggested mentor texts and seeing how I can apply them. I already see how the Ginsberg book and Radiant Child might be helpful. Also, thanks for sharing your editor's advice. Thanks for an enlightening post, Nancy. I love biographies and will certainly use your recommendations. Thank you for your post! I especially like your point about how Jen Bryant's text showed how Peter Roget saw the world through lists. Melissa Stewart's illustration supported that brilliantly. Love your mentor text suggestions! Thank you for showing us first hand how mentor books can be used for our stories. Great picks for mentor books, Nancy. And great reasoning behind the picks. Can't wait to see your new one. Great choices Nancy...I love these books! I kerp thinki g biographies aren't for me, and then realuze how many rabvit goles I go down in just onw day folliwing my curiosity avout peiple. Thanks foe tbwse texts, Nancy. Hatd to believe we are only 8 days into reforemo. I'm loving all the texts so much, my house is filling up because I want to keep re-reading! Fabulous books! Thank you, Nancy! I love picture book biographies! Thank you for sharing these great examples and how they were useful to you as you wrote your story! Thanks for that great selection of books! I like the way you connected each one specifically to the text you are writing now. Looking forward to reading it! "I didn't know how much I didn't know..." Ain't that the truth! Thanks for the honest words, Nancy! Great reading about how each of these texts related to your own work. Thanks! Great idea to zero in on a particular plot theme or language technique that pulls together a book - insight to bring to one's own works for what's working, what's missing, and ideas for revision. Thanks. Of all these NF PBs, I hadn't read I Dissent. It took a while to get it from the library and it finally came in the day before. So, there I was on Women's Day... standing at my writing desk... SOBBING! And, there's the power of a great picture book. 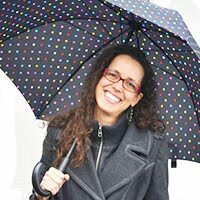 I love your quote, "The beauty of ReFoReMo is that an idea you pick up from here or there may lead you to the magic ingredient that will bring your manuscript to life." It's so encouraging to learn from traditionally published authors and to find out that many of them are still learning, too! Thank you for sharing your helpful insights. Such a wonderful example of using books for research for a current project. This was so inspiring. Thank you for sharing. I know from personal experience how hard you work to make your stories sing, Nancy...and you always do! Thank you so much for 5 excellent mentor texts and how and why you used them. Loved your post! Thank you for the wonderful suggestions and congratulations to you. Thank you for terrific insights and list of books. I've always liked biographies, but never thought I could write one. These are great examples. Maybe I can. Thank you for the inspiration. Amazing examples! Thank you. Now I am off to the library (or to lurk around the bookstore yet again) to do some very enjoyable research. This was very inspirational; thank you Nancy. 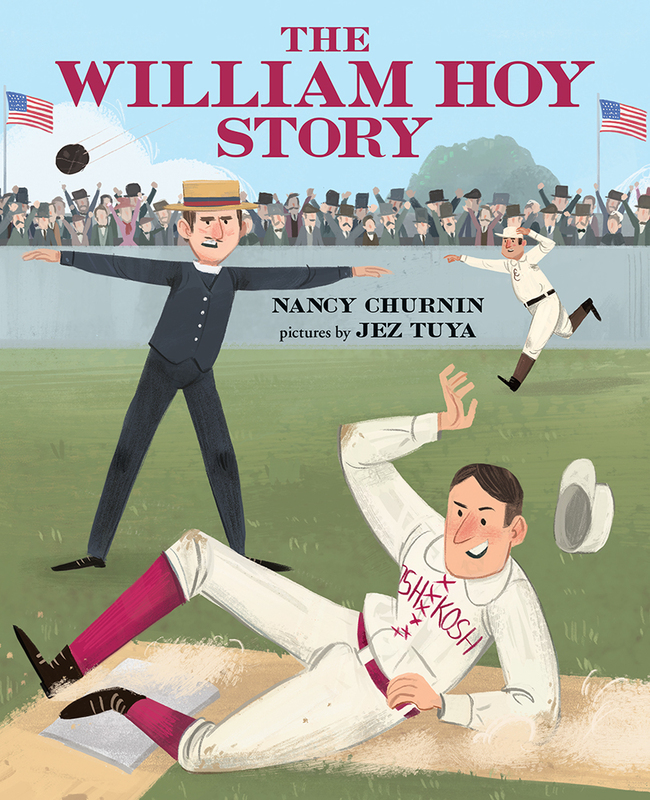 Nancy, I absolutely love your book about William Hoy. He was one of my uncle's favorite baseball players which makes sense because my uncle was deaf. Your assignment was a great one as you gave us new thoughts about each of those mentor texts we might not have pondered. Thank you and good luck with your next releases. Thank you so much, Nancy! I really enjoyed the selections, though I wasn't able to get all of them. Dizzy and The Right Word were my favorites. I love picture book biographies and learning about the "real" people behind them. Thanks you for sharing. Nancy, i share the same fear where i don't know what I don't know about PBs. There are lot of biographies i wish to produce as PBs so reading this post is really helpful. Fantastic biographies, especially The Music in George's Head. All wonderful mentor texts for a project I'm working on. Thank you. A nice list - thanks for sharing. I have added a few to my Hold list at the library. Thank you for sharing! It was helpful to know how you use mentor texts. I loved the first sentence of "Radiant Child". Thank you for an inspiring post, Nancy, and congratulations on your continued success! A great line-up -- and LOVED your book. Thanks, Nancy! Thank you for your enthusiasm, Nancy. I had never thought I'd want to write a picture book biography, but you've made me start considering it. This list inspires...eager to read all of them. I'm currently working through the beginnings of a PB biography and I know some of these mentor texts will help me in that process. Thanks for sharing! Great selections, super helpful, thanks!! Thank you for your post and title suggestions.